Today I have a new technique to show you. 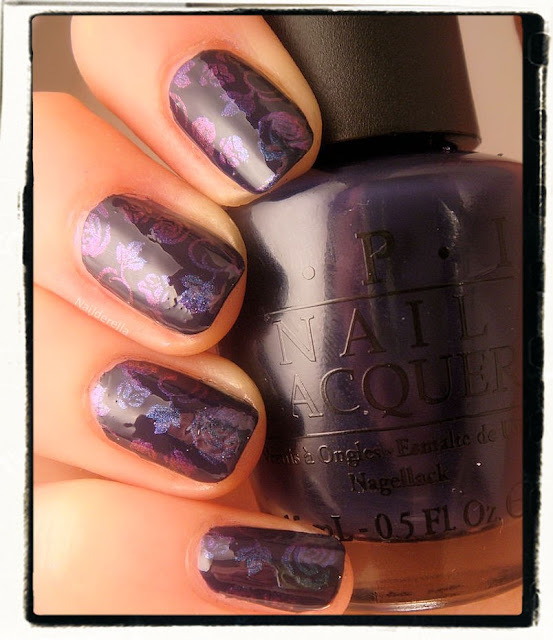 This is a multichrome pattern you can achieve with Konad image plate. I saw this on Penelope Luz's blog, Esmaltólodras. I found it so pretty and original, I tried exactly the same mani! 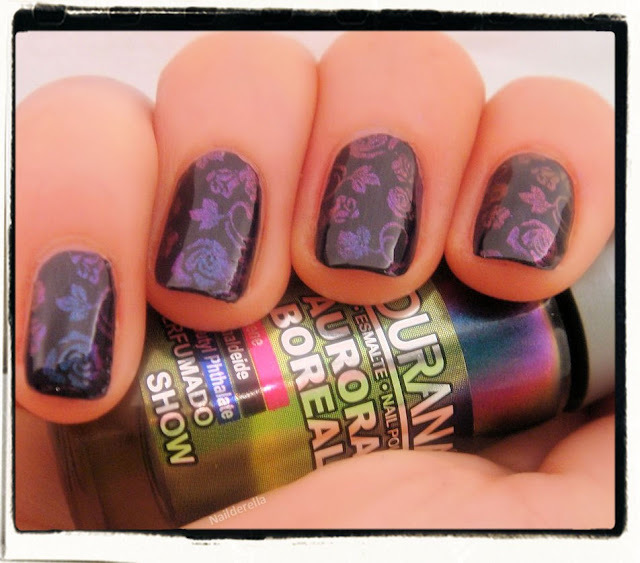 Here I used Show (Aurora Boreal collection) to stamp over 2 coats of OPI Road House Blues. The Konad plate I used is m65. Ludurana multichromes are much more pigmented than the Ozotic multichromes I tried so far. I think this is the major difference between these brands. Otherwise, Show is really close to Ozotic 505. When you will paint over your image plate, you will have the impression the polish pigmentation is not enough, but you have to keep going on! Take you scraper and scrap off the excess polish. At this point, you will really have the impression there is nothing left on your image plate and that it won't work, but again go on! Take your stamper and roll it over the design. Yay~ you will see the pattern on the stamper. Add one coat of top coat and it will bring your multichrome pattern to life! Now you can admire your nails and wave them in all directions to see the shift in colors! I think this is such a great idea! Now I want to try it over different base colors and different multichromes! Ludurana polishes can be purchased from Llarowe. This is the US stockist for Glitter Gal, Ozotic, A England, Hits, Ludurana and Lynnderella polishes, awesome nail polish brands.They sell internationally and have an awesome customer service. You can visit Llarowe on Facebook.